Two and three days ago the night time temperatures dipped into the 20s F. The flowers of this tree, like other maples, are very cold hardy. No noticeable freeze damage occurred. 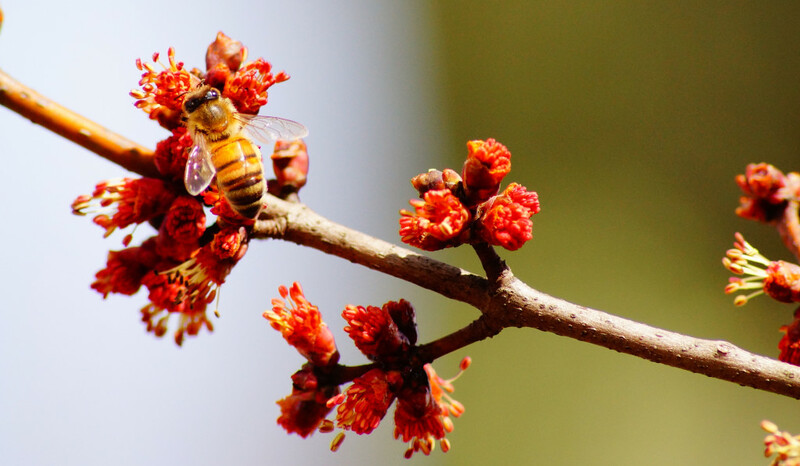 These trees are frequent in forests and suburban areas making it a major source of food for bees this time of year. 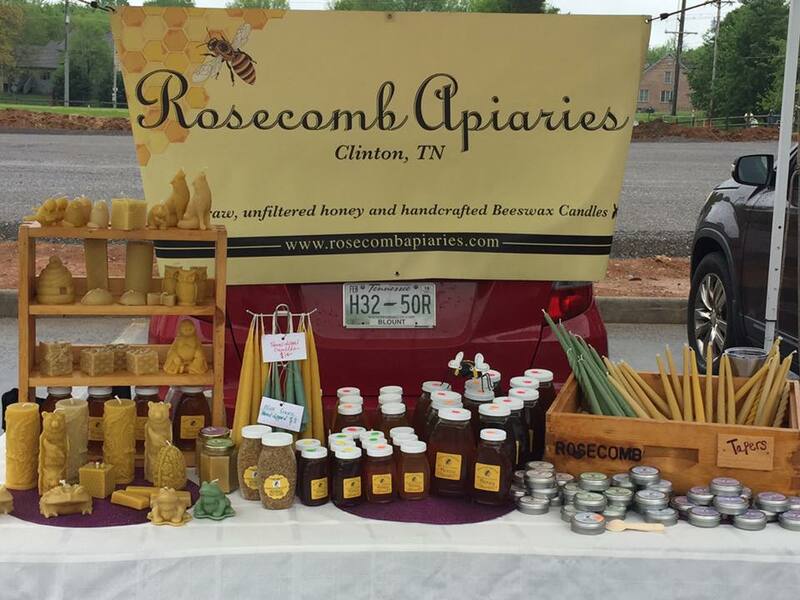 Honey from maples is very sweet with hints of maple syrup. It is light in color and crystallizes very fast. 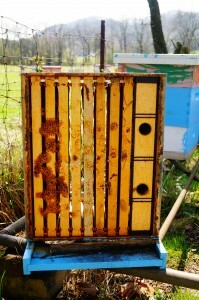 Pure maple honey is very rare due to its early season flowering. 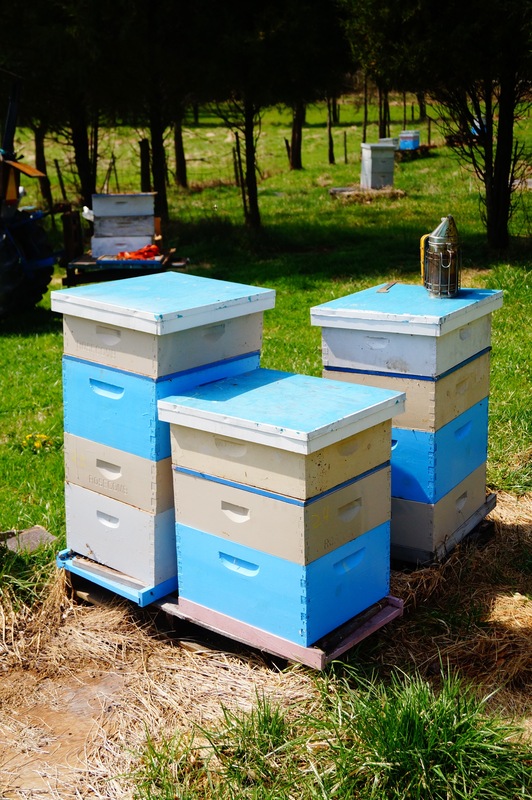 Most colonies are not built up enough in strength to store surplus honey from maples, plus the weather varies greatly in spring and nectar is not usually converted to honey when temperatures dip close to freezing and rain is frequent. 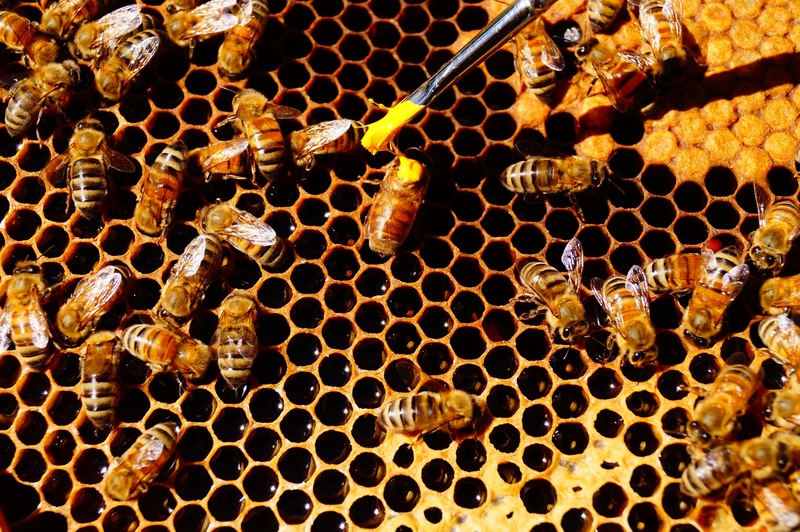 Instead, it most often gets fed to bee larvae as the colonies rapidly grow this time of year. 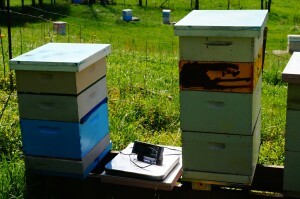 However, after inspecting some colonies today, some nectar is getting converted to honey. 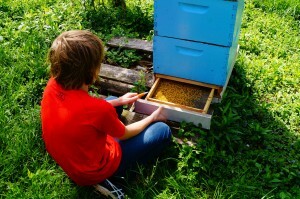 Maybe we will have some hints of maple syrup in this year’s early honey crop. 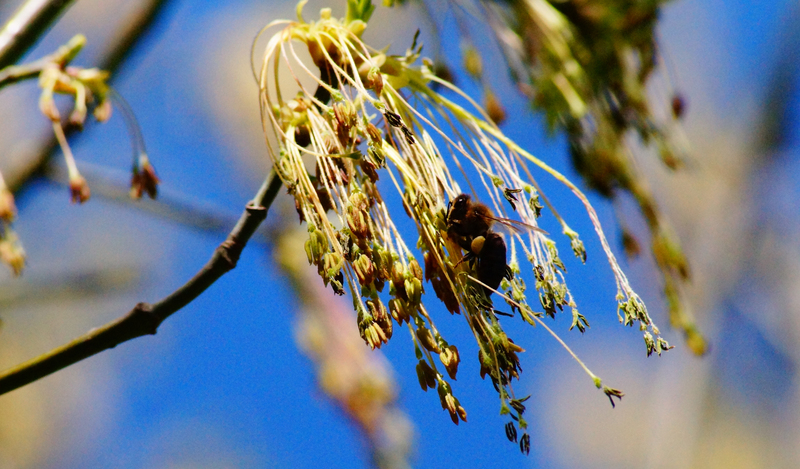 Along with Box Elder, the Sugar Maples are flowering at about the same time. Sugar Maples have similar flowers, but distinclty different if you look close. Sugar Maples are the source of maple syrup. 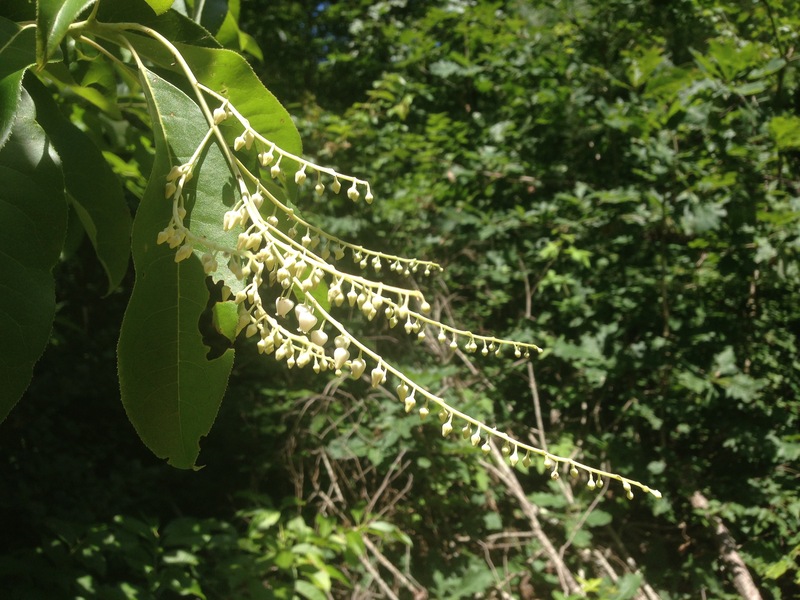 This tree is generally more associated with the northeast, however its natural range dips down into East Tennessee as its most southern natural habitat on some habitat maps, while other maps show its range going much further south. Honey bee on the maple, Box Elder (Acer negundo) flowers. A Red Maple in my yard began flowering today, March 11, 2015. 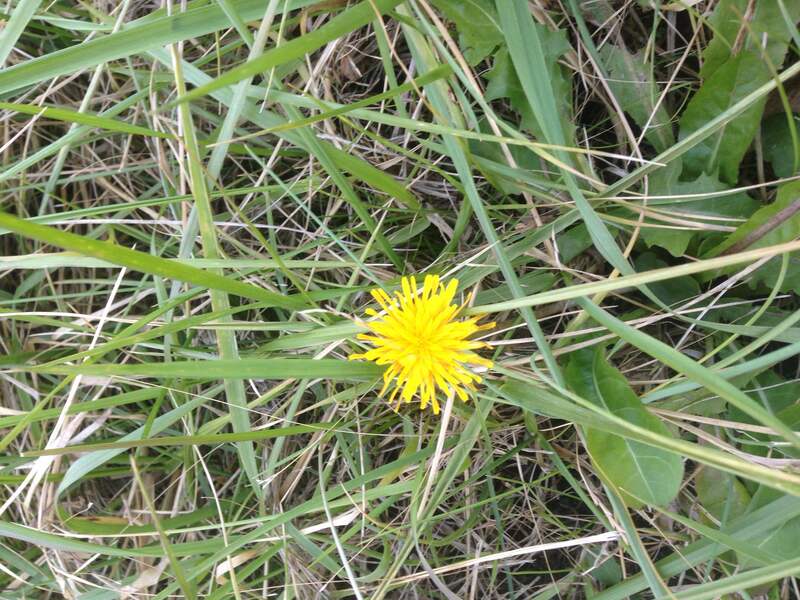 This is one of the most important spring nectar and pollen plants for honey bees in our area. Its flowering marks the main start of the season. 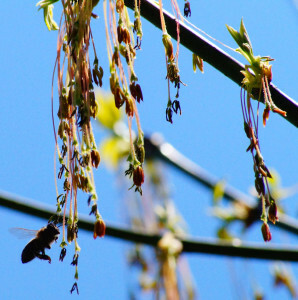 Maple trees are important to build the colonies up in population by providing a large supply of carbohydrate, nectar and protein from the pollen. Colonies don’t often produce surplus honey from Maple trees due to rainy cool weather, but these trees are still one of the most important plants for a good honey season. 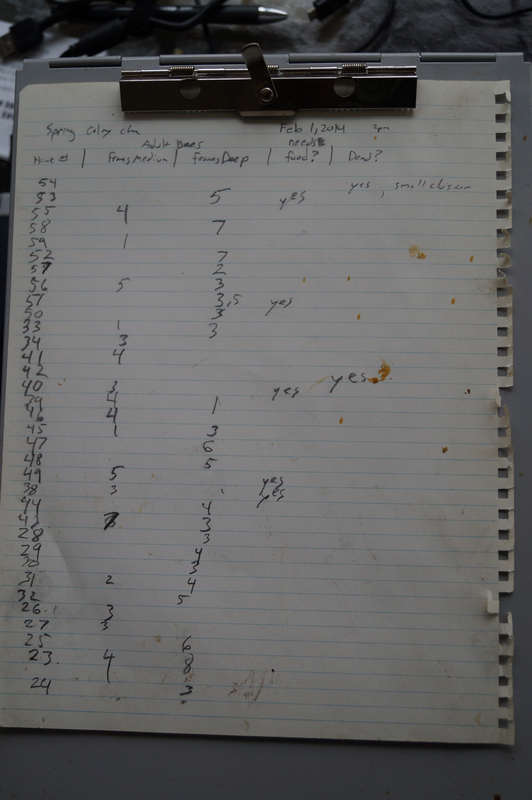 Here are counts of frames of bees, a note on if they need emergency food, and if they are dead. 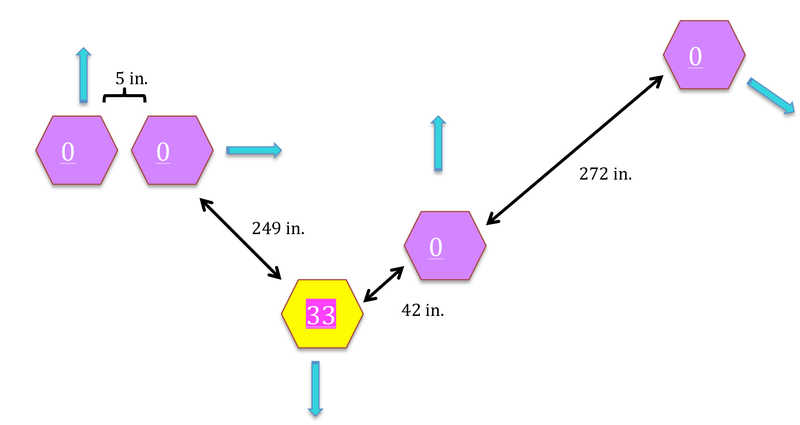 These simple notes help a great deal for both selection and understanding the state of apiaries for managment needs. 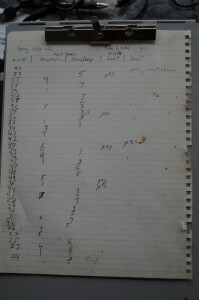 To take notes, I recomeend a clipboard to keep paper from blowing away and a sturdy piece of paper. This one is water-resistant but stained with pollen substitue. 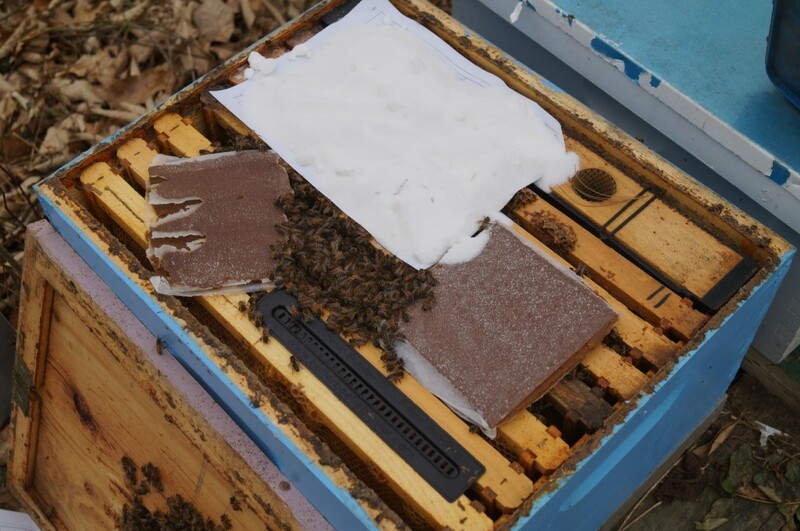 After a few weeks of sub-freezing temperatures, we had a warm few hours in the mid 50’s F on Febuary 1st, 2014 where I was able to check the status of 50 colonies at my home I’m evaluating as potential queen mother colonies. 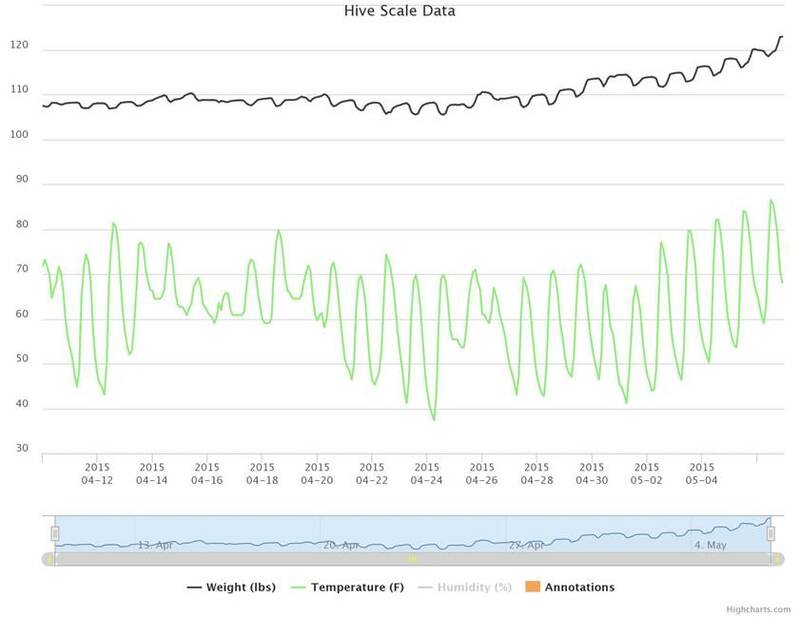 Still being winter, I did not want to break up the cluster very much to do things like count varroa mites, so I only did a simple evaluation of adult bee population. This winter has been pretty good to the colonies. 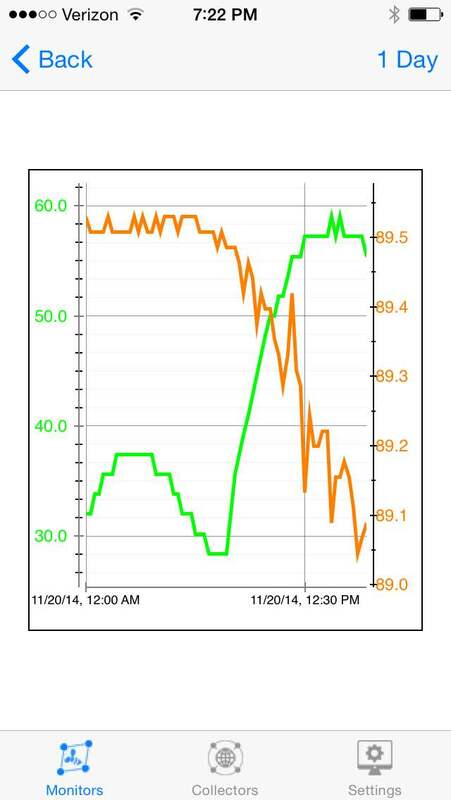 There hasn’t been much fluctation in temperatures, which causes them to use up their stores too fast. Although I would like to see larger populations in the hives, most were strong enough and I’ve only lost 5 out of 50 (10%) so far. The national average, yearly winter loss hovers around 30%. Here are some more stats. 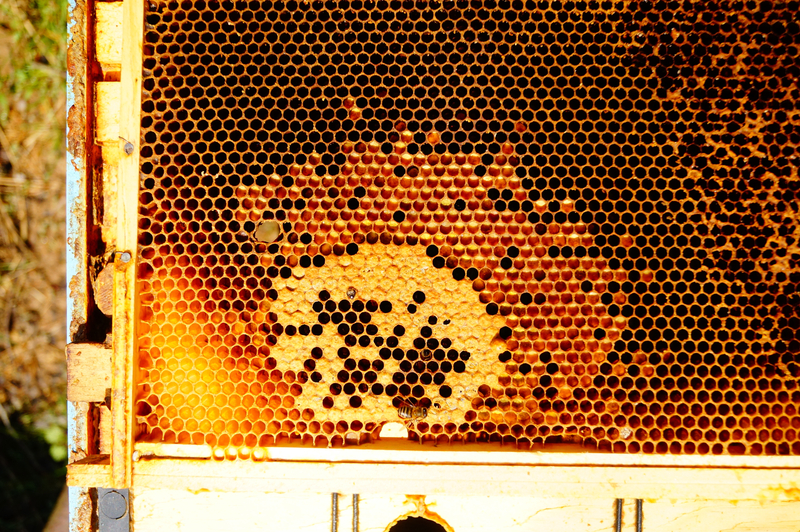 Of the 45 surviving colonies on Febuary 1st, 2014, they averaged in strength at 4.5 deep frames of adult bees (median value was 4 frames). 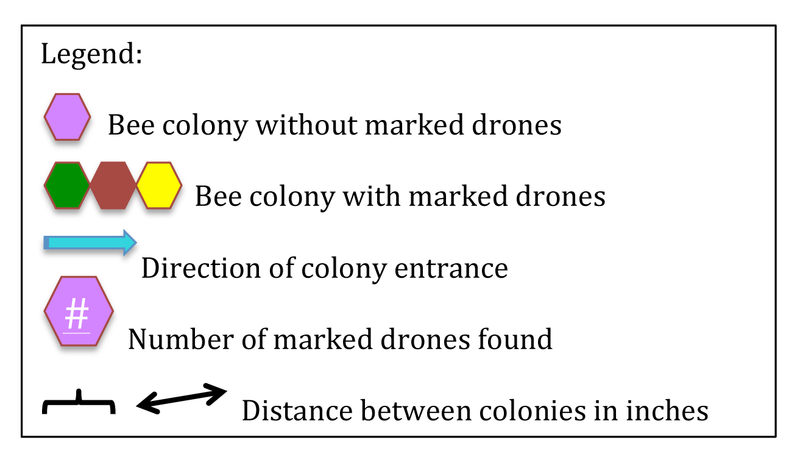 The top 25% colonies had 6 or more deep frames of adult bees. 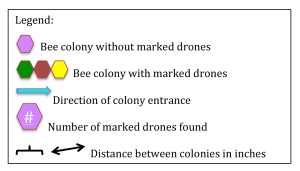 While the bottom 25% had 3 or fewer frames of bees, wich leaves 50% of the colonies having between 3 and 6 frames of bees. The bottom 25% is concerning, but at this stage of spring, even those have a good chance of doing OK. The selected queen mothers for 2014 will most likely be chosen from the top 25% in this measure. However, its still too early to say. 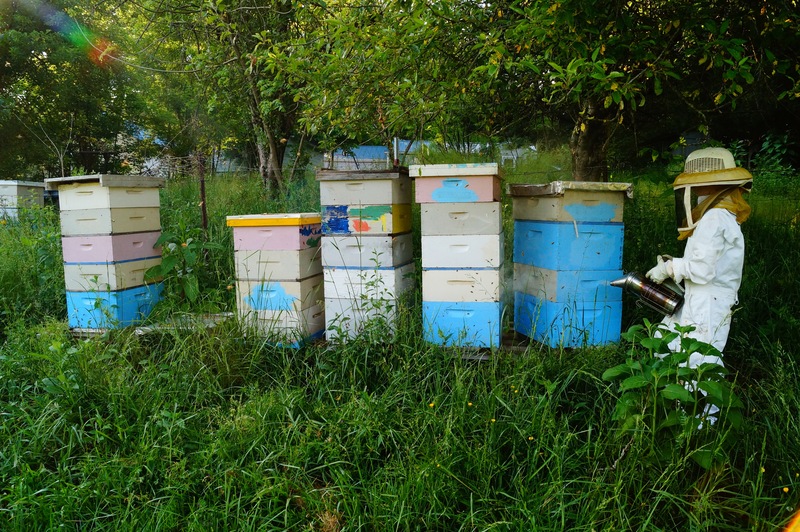 Some other colonies might really take off, or some of these might dwindle if they develop a virus problem from too many varroa mites. 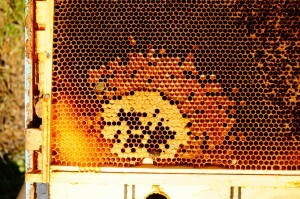 Early Febuary is a good time to look for colonies that need emergency feeding. 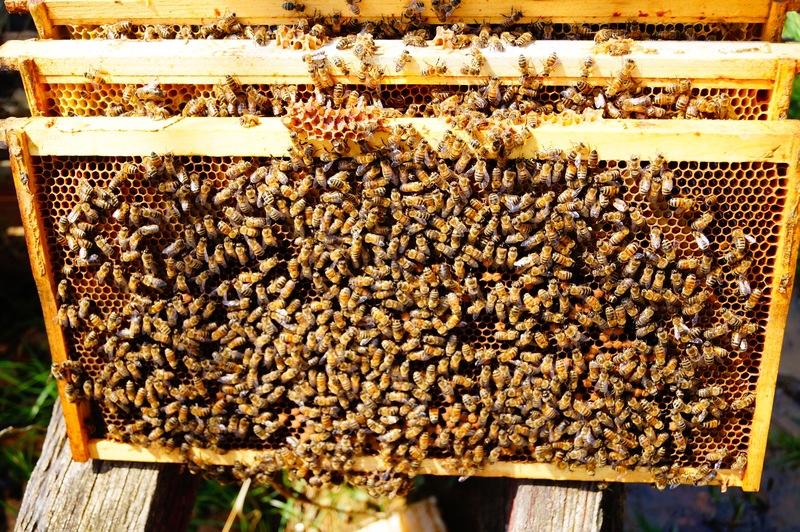 As the day length and temperatures increase and the colonies begin to raise brood, they can quickly use up the rest of their stores and starve as the cold, rainy weather sets back in after warm spells. 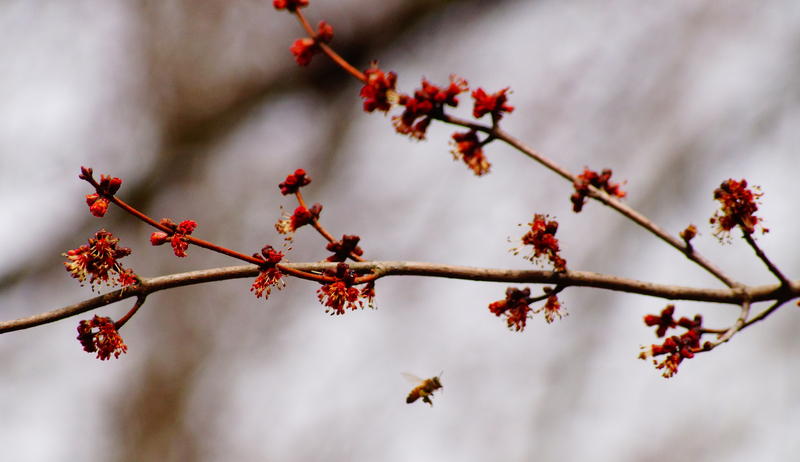 The maple trees can produce a great deal of nectar here in Febuary, stimulating brood rearing. 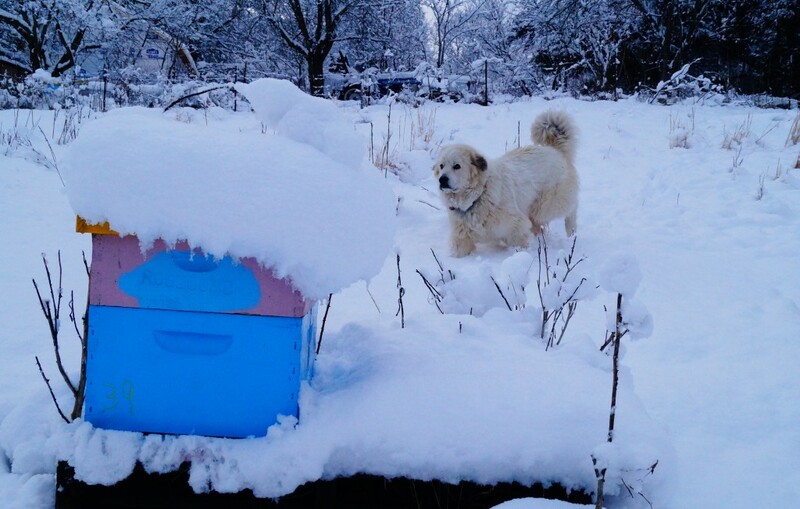 Winter Feeding: Its better to feed dry foods for bees when you want to prevent them from starving, but don’t want them to start raising alot of brood. Here I have placed dry sugar on a piece of paper and pollen patties (which contain mostly sugar), on the top bars. 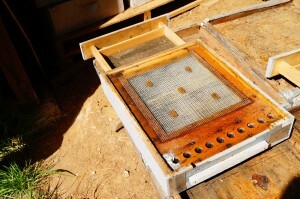 The inner cover is flipped over to make enough room, but a larger spacer instead would allow more food. Mixing a small amount of water with the sugar to make a paste works well too. 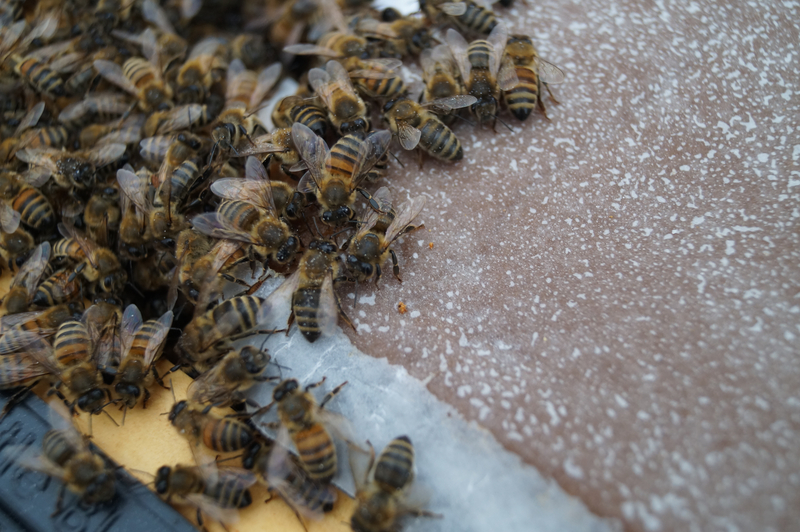 Using newspaper to place the sugar on is best because the bees easily chew it up when done. On the day I added this dry sugar, it was about 45 degrees F, which is too cold to break the cluster up by moving frames, but OK to add some sugar. 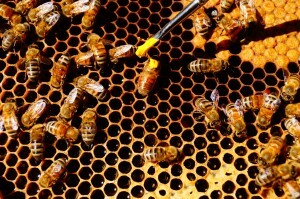 They were already active and feeding on the pollen patties when I opened the hive. 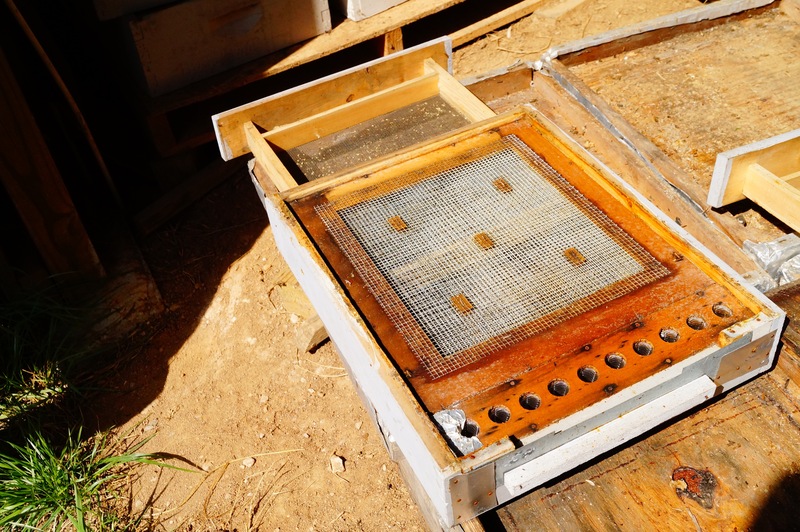 I should also mention the hive beetle trap shown here. Leaving them in overwinter yielded probably 1000’s of trapped beetles among the 50 colonies. Hopefully that will help. 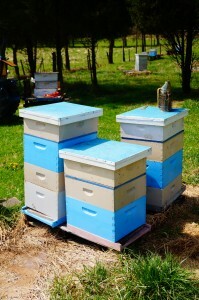 Late divides and overwintering nucs, or small colonies. 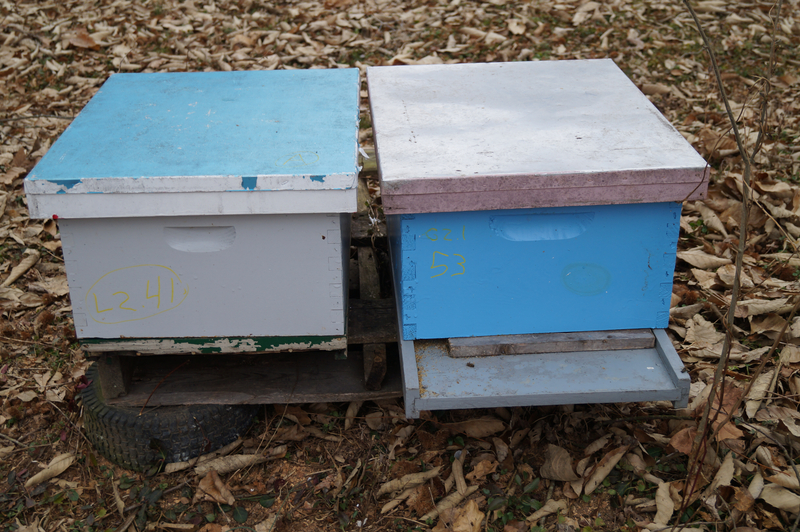 Pictured here are two colonies made from a single, double deep colony late in 2013. The right one is the one being fed emergency food (pictured above), and the left one died. 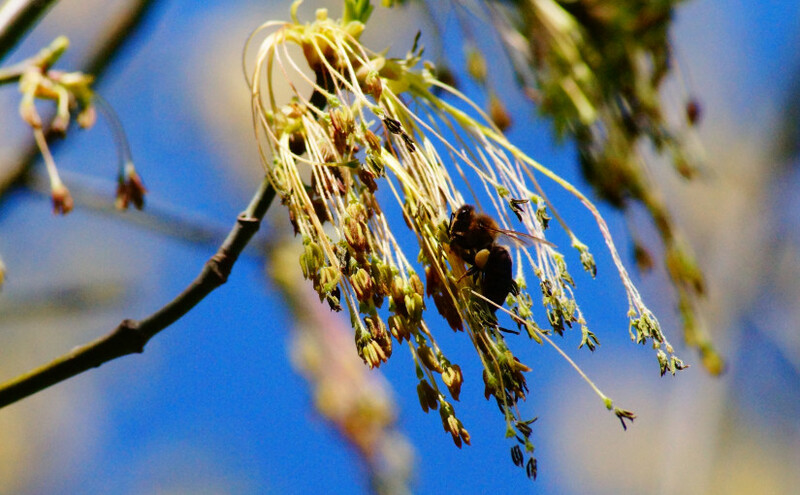 Its better to try and overwinter strong colonies that will be ready to take full advantage of the Febuary maple flow, than to invest in overwintering more, smaller colonies that need a great deal of help in Spring. 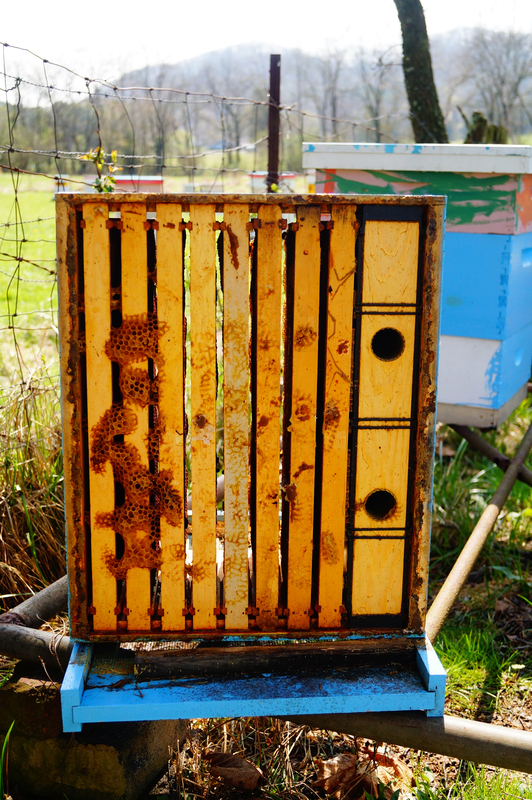 As an experiemnt this year, I tried to overwinter 14 nucleus colonies I made late in summer. Only 2 are likely to survive. 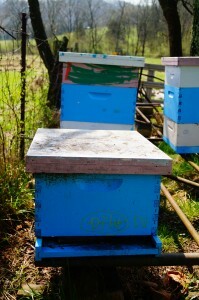 I tried to overwinter these nucs mostly because lots of other people get excited about the idea of overwintering nucs. I’ve always been skeptical of the utility of this concept in our area, not because our winters are exceptionally cold, but for other reasons. 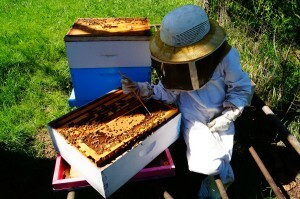 One is that small colonies in late summer, early fall often get robbed out by other bees and destroyed by hive beetles. Then, you can’t really treat them for mites with organic methods, because they are not strong enough. 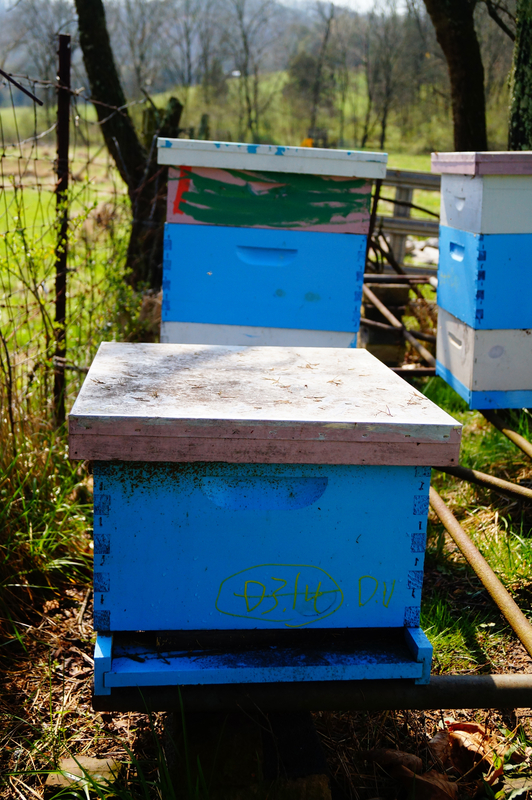 During winter, our temperatures often fluctuate and stimulate brood rearing in late January as the days get longer. 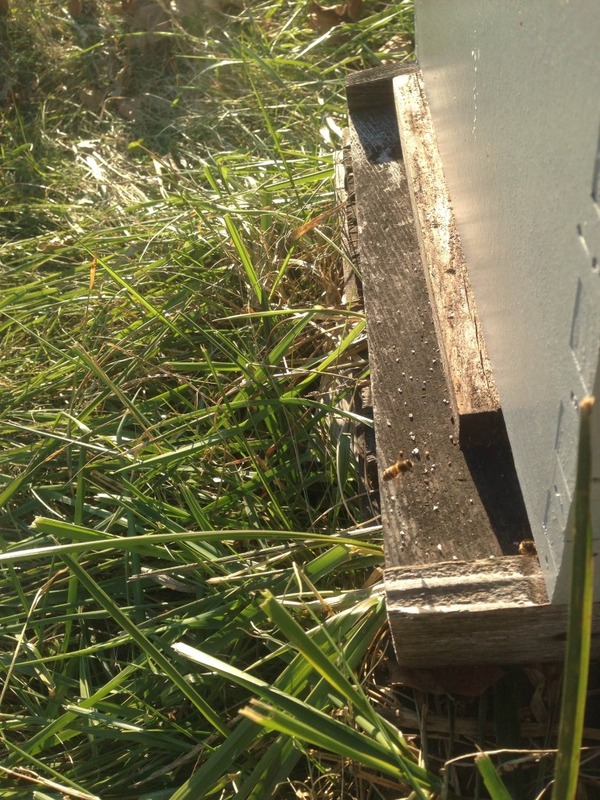 If a small colony raisies some brood, they will not be able to get to the nearby stored honey or emerency sugar when the temperature inevitably drops again, and they starve. 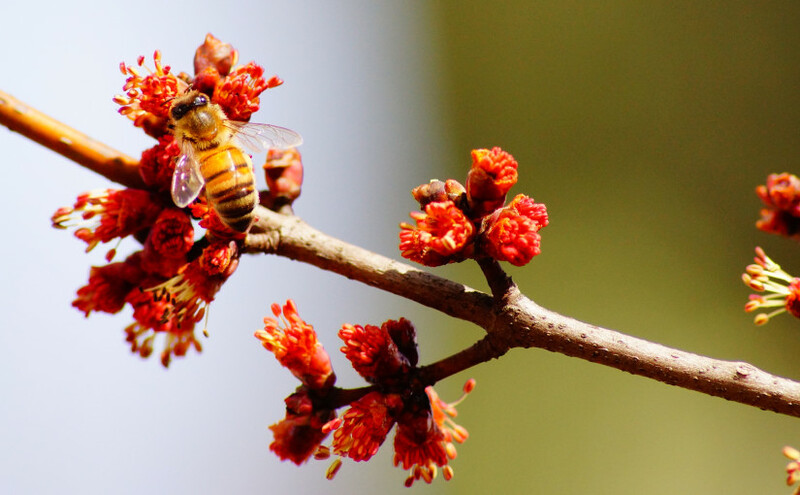 Finally, if they make it to spring, they will not be strong enough to both warm up a large enough area to raise much brood and have a strong enough field force to take full advantage of the maple tree bloom in Febuary. 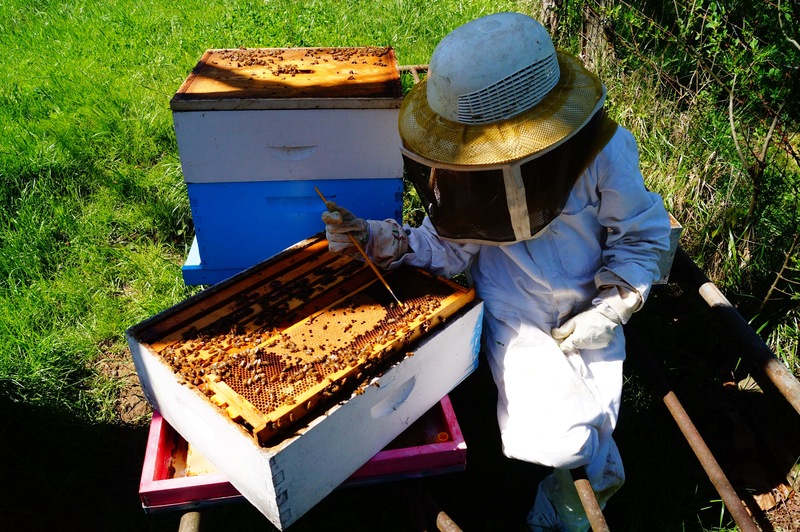 A strong colony can raise many, many bees in early spring that can be divided later in spring multiple times and still make honey, while small colonies rarely grow to a size that can both be divided and make honey. I recomend if you want more nucs in spring, to overwinter more strong colonies, build them up early in spring with supplemental feeding, and divide them just before they swarm. Bees at the dinner table on Febuary 2nd, 2014. They have some dry sugar on them too as I just dispensed some nearby. Today it was 45 degrees, and we just thawed out after a week of below freezing temeratures.